The PHA Comp module in ProSET® allows for the input of Actions that are associated with specific Causes. To enter a new Action click on the ‘+’ button in the Action column. By selecting the ‘New’ radio button you can add a new Action. 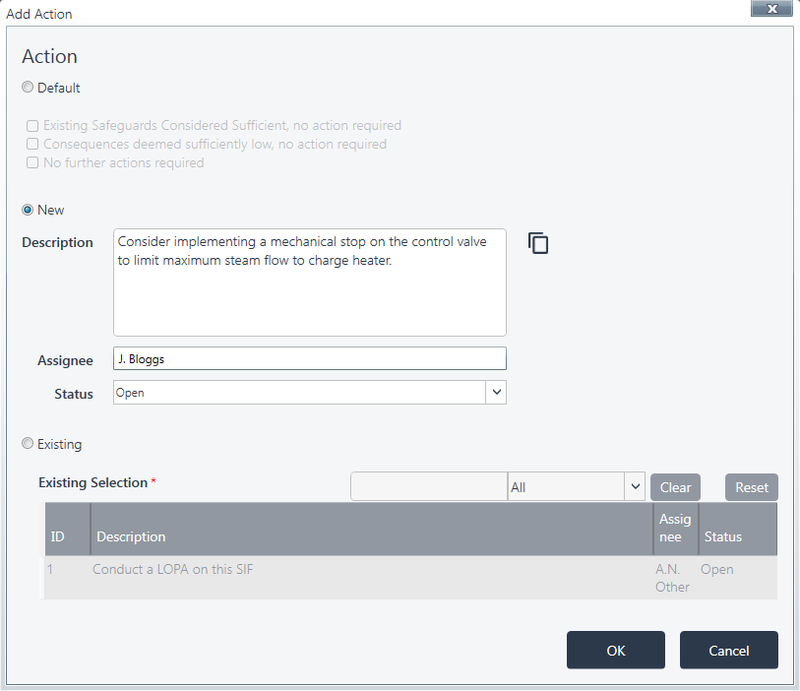 PHA Comp also allows you to select an existing Action instead of re-defining the same Action multiple times in a project. To add an existing Action, select the ‘Existing‘ radio button in the “Add Action” box. Note – When an existing Action is selected the data will appear in the fields at the top of the window. The user can then select “New” and the data will remain. This is a quick way to pre-populate the fields for a new Action that is very similar to one that already exists. Edit Master should be used when the existing Action has been used in several instances across a project and the edit applies to all instances. Using this feature will change the Action in every instance that it is used. To Edit Master right click on the required Action and select “Edit Master Action (Warning)”. Warning: Editing the Action whilst selecting this option will affect this Action in all other instances where it has been used. If the existing Action has been used in several instances but needs to be changed only for one specific instance, select Use As New. 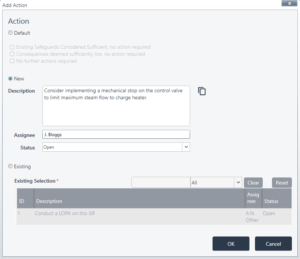 Using this feature will create a new Action using the same data, allowing you to edit it without affecting the other instances where the original Action is used. To Use As New right click on the required Action and select “Use As New”. You can now edit the Action without affecting the original.